We have had a very busy few months with everyone wanting stages in time for their Christmas Productions. To nurture confidence, build self-esteem and help create fun and laughter by working with Schools to encourage all School Children to love learning & performing. To celebrate this, we are running our 12 Days of Christmas Productions on our Website and on Social Media. On the 12th Day of our #12DaysUnistage Xmas Showcase we wanted to share how pleased we were to be able to lend some staging to Crossdale Primary School, which provided a Wheelchair Access Ramp in time for their production, until their brand new stage will be delivered in the New Year. At Unistage, we strongly believe that every child should be able to perform in their School Nativity, which is why we have designed a range of products to ensure that children of all abilities can become stars of their performances in a safe and easily accessible setting. Crossdale Primary School sent us a lovely slideshow of some of the images from their performance, and we have featured a few of their pictures above. We hope that you enjoy looking at the images from Crossdale Primary and we hope that you have enjoyed our #12DaysUnistage Xmas Showcase. Thank you to all our customers, old and new, and to all the teachers, parents, grandparents, aunties, uncles, family and friends… and especially the children for putting on such a fantastic show. Have a very Merry Christmas and a Happy New Year from all of us here at UniStage. On the 11th Day of our #12DaysUnistage Xmas Showcase, we have some photos posted yesterday on Facebook by Mount Carmel School in Accrington. The Children in the Carol Concert held in the School Hall last week look brilliant on our stage that was hired from us. Lots of schools find it extremely useful to hire our stage, especially if they cannot afford to buy one or justify the investment for a stage that may only be used for a one-off event each year. We get lots of enquiries for hiring and its great to see customers coming back to us each year, which many have been doing now for 15 years. Our customers love the fact that we deliver to site, install and collect the stage after they have finished. Building the stage is easy, but takes time, which is why we take care of everything, so our customers can concentrate on getting ready for their shows. We love seeing all the Festive photos from Mount Carmel School and think it looks particularly special with the Christmas Tree and Santa hats! Thank you again to Mount Carmel for your business and we look forward to seeing you again next year. For Day 10 of our #12DaysUnistage Showcase, we have seen Whitegate Primary School and Nursery putting their stage to great use with the Carol Concert this year. It’s lovely to see all the Children in the Festive Spirit with their Santa hats and the School Hall looks really beautiful with the Christmas Tree and all the lights. We are certain the children sounded fantastic and the best bit is that we know for sure there will have been no rattles or squeaks from the stage so everyone could hear their wonderful voices. We know how much hard work and practice everyone puts in to making it a success so it would be a shame for them to go unheard. It looks like they don’t just get their stage out at Christmas time but we have seen the images of it being used for Star of the Week too. What a great way to really get the most out of the stage. A Unistage really is a fantastic addition to any school all year round! We would love to see more photos of your little ones performing this year. Please send us your images or post them on Social Media using the hashtag #12DaysUnistage and let us know what you have been up to! On the 9th Day of our #12DaysUnistage Christmas Showcase this lovely picture reminds us about who the real stars are, in your festive shows, plays and performances. But if you don’t have the right stage to perform on, the stage itself might start becoming the star of show, making more noise than the stars that matter. Unlike other staging systems we use a unique design sound absorption solution (SAS) to ensure our stage is seen, but not heard. We have the quietest portable staging system on the market in the UK, which means your show or performance won’t suffer from unnecessary noise caused by people walking, running or dancing on the stage and your audience will hear every word! We would love to see photos of your little ones performing this year. Please send us your images or post them on Social Media using the hashtag #12DaysUnistage. On the 8th Day of our #12DaysUnistage Christmas Showcase we wanted to point out the fact that a UniStage is for Life, not just for Christmas. This year we loaned the Show and Tell Classroom Stage shown in the images to Holy Trinity Primary School in Stacksteads. Getting involved on Life’s ‘small stages’ is great for building confidence within pupils before those little stars of tomorrow are ready to move onto a bigger stage, in School or out of School. Even the Children ay Holy Trinity that are not as confident as most, really love dressing up on the stage and performing to their classmates. We have even had an order for a Show & Tell Stage as a personal Christmas Present this year, which has been delivered to a Home. What a great platform for a game of Christmas Charades with all the Family. We hope our Customer loves performing on his very own stage this Christmas. If you would like more information about our Show & Tell Stage or any of our Portable Staging, please do not hesitate to get in touch. Scroll down for more photos and get involved on Social Media with the Hashtag #12DaysUnistage. On the 7th Day our #12DaysUnistage Christmas Showcase it’s got us feeling all nostalgic and we were reminiscing about some of our fondest memories of Nativity Shows when we were younger. The image above was kindly provided by our very own Charley as she was telling us her memory of being a Shepherd in the Christmas play at School. Her tea towel fell off her head whilst dancing on stage but in true star style, she carried on through to the end! Well done Charley! Another fond memory was shared by Alex when she was ‘The Smallest Angel’ in her Christmas play who couldn’t go with all the other Angels to share the news about Baby Jesus as she was just too small. Is it any wonder she was chosen for this part as even now she is still only 4ft. 11! Why not comment on Facebook or Twitter using the Hashtag #12DaysUnistage with your favourite memories from your School Nativity shows or perhaps you have been to see your child this week and have a funny story to share. We look forward to hearing about it! 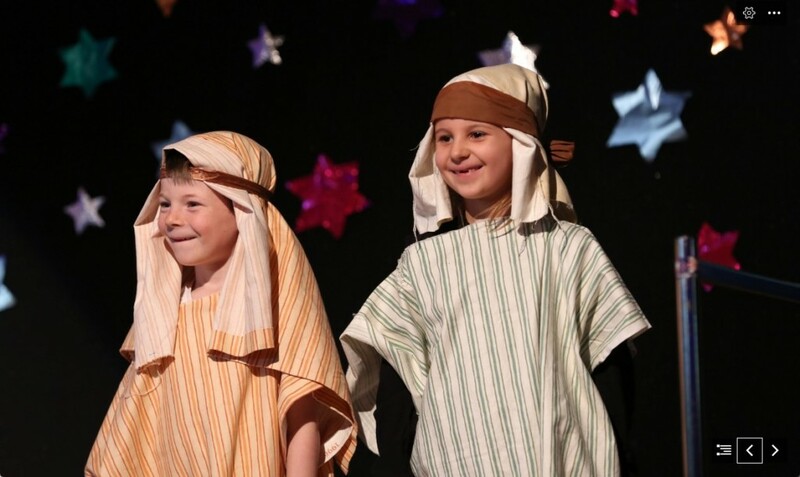 On the 6th Day of our #12DaysUnistage Xmas Showcase we have some brilliant pictures that Haimo Primary School posted on Twitter using their Unistage for their Christmas Nativity this year. They bought their stage from us in 2012 and this shows what a fantastic asset to the school the stage has become, which gets used year after year for all kinds of shows and performances. We think the props and costumes could be mistaken for an Amateur Dramatics Group. There must have been plenty of time and effort gone in to prepare for this play and it looks like the children, the real stars of the show, are having a great time! Scroll down to see photos of others shows and to find out how you can get involved in our showcase. Day 5: What Are These Angels Up To Now? On the 5th Day of our #12DaysUnistage Xmas Showcase we wanted to show you a few of our favourite Unistage images. It would be interesting to know what these little Angels and Kings are up to now 7 years on and what their Unistage is being used for this Christmas! We would love to see photos of the Christmas Productions your school has been putting on this year. Send us your images and keep an eye out when you’re featured in our #12DaysUnistage Campaign. On the 4th Day of our #12DaysUnistage showcase we have a #ThrowbackThursday. We spotted Fieldhead Carr Primary School (@FieldheadCarrPS) using their Unistage which they purchased last year for their Nativity this week. The Three Kings, Shepherds, Angels, Lambs and Donkeys all look wonderful. We hope you had lots of fun rehearsing and performing this year and for plenty more years to come. We love seeing the shows that you are putting on and knowing we can help to develop a child’s confidence. No doubt, there will be plenty of proud parents, grandparents, carers and teachers sat amongst the audience. Keep sending in your images or tag them on our Social Media pages using #12DaysUnistage to be featured in our Showcase. For the 3rd Day of our #12DaysUnistage showcase, St John’s C of E Primary School sent in this lovely picture of the Children from the Nursery, all dressed up and ready for their Nativity Play. It looks like Father Christmas also made a special early appearance and from the looks on some of the Children’s Faces, it looks like they are a bit confused as to how Father Christmas ended up in Derbyshire when he has far too much to be getting on with at this time of year. We think it’s lovely he took the time out of his busy schedule to visit the Children. For Day 2 of our #12DaysUnistage showcase, the image in the Tweet posted on Twitter by Brooklands Primary School reminded us about all the hard work that goes on behind the scenes to put on all the Christmas Shows around the UK. We wanted to take time to give credit to the Children who prefer to work off stage as part of the production team, which is just as important as those on stage performing. A great production would not be possible without a great team effort by all the staff, pupils and parents who work hard off the stage, involved in writing the scripts and songs, making costumes and props as well as helping learning lines! Your work is appreciated by all. We were recently talking to one of our friends here at UniStage called Brian, and Brian was telling us about one of his proudest moments 30 years ago when he saw his daughter perform and sing in public for the first time at her first nativity play. This was one of his proudest moments, something he will never forget and one of the main reasons why we love this time of year so much, because we can help create cherished memories for life. Brian and his Daughter, who is now 34, have just watched Brian’s Granddaughter perform at her first nativity play, but unfortunately, he was not able to see his Granddaughter as well as when he watched his Daughter all those years ago. Class sizes now mean that a lot more children are taking part in nativities. In addition to this, a lot more Parents, Grandparents and Carers are now watching festive plays, which means that for some people, they are not able to to get a view of their little ones as much as they would like, which is a real shame. For these reasons why we have created a range of Seating and Staging products to offer a solution for Schools, Parents and Grandparents, so that everyone can enjoy the show much better because they are able to see their pupils, children and grandchildren much easier. We have a range of accessories including ramps, steps and guardrails to ensure everybody has full access to the Staging and Children are safe. This is an ideal solution when you want to keep your performance on flat ground. If you have a Christmas Story involving a Stage Performance at your school or if you need any advice on how to make the most of your performance using Portable Staging, please do not hesitate to get in touch, using the details below. We would love you to get involved, so we can show-off your Christmas Productions! Please send us your images via email to enquiry@unistage.co.uk. We can’t wait to see your pictures and we are really excited to see what Shows your pupils have been performing on your Unistage!